One: The Lord is king! All: The Lord is mighty! One: Everyone praise his great and majestic name. All: The Lord is the Holy One! One: Mighty king, you love what is right. All: You have brought righteousness and fairness. One: Praise the Lord, our God. All: The Lord is Holy! * Display all the candles of the liturgical year (Advent candles, little candle lighting services candles, regular Sunday candles, paschal candle, baptism candles, etc.) Name them and light them telling what each one says to us as we light it. Then urge worshipers to watch for God’s glory and light in worship today. 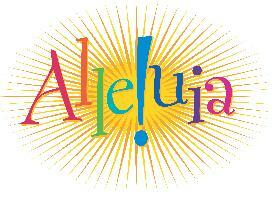 Create a call to worship in which the congregation replies “Alleluia” to selected phrases from Psalm 99. A word sheet with the repeated "Alleluia! Amen!" highlighted helps young reads. 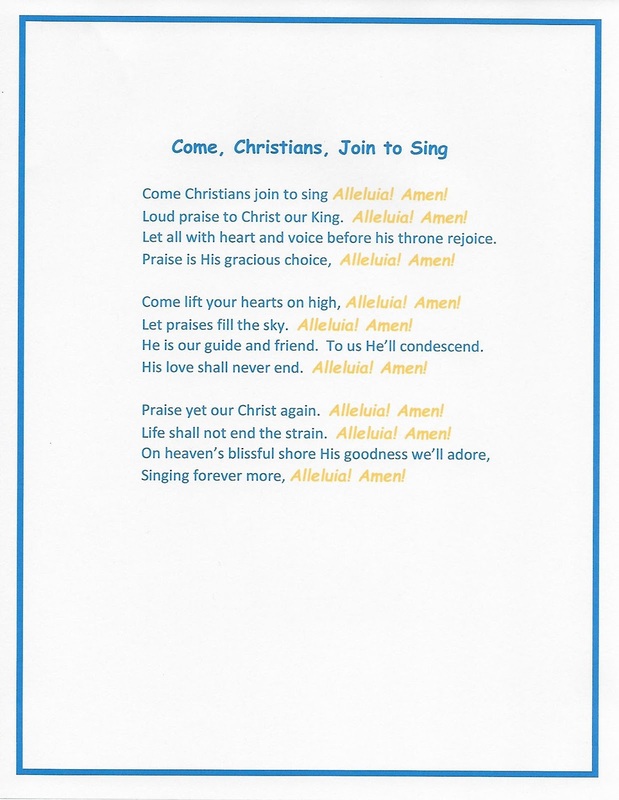 Save the alleluia filled Easter hymns to celebrate the return of the Alleluia during the Easter season. 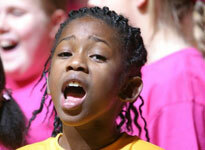 * The hymns based directly on the transfiguration story are not very easy for children to sing. Instead sing hymns about Jesus’ power and glory. 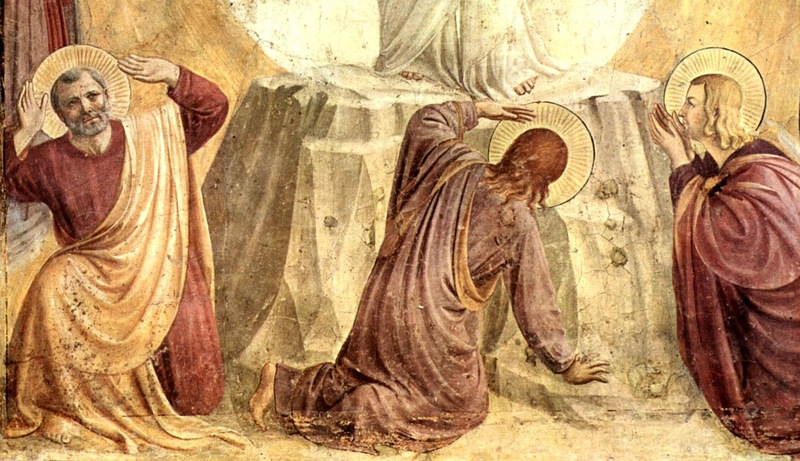 Because today is Transfiguration Sunday, it is all about the gospel story. All the other texts relate to it. So, let’s start with Luke’s account of the Transfiguration. * Omit verses 37-43 for the sake of the children. Focus instead on the first story. 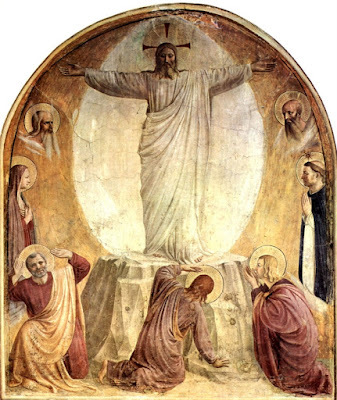 * The word transfiguration is long, strange and used only on this day for this story. The dictionary definition refers only to this story. Given that, it may be simplest not to use it with children (or even adults) at all. If you do use it print it on a large poster to use in sounding out the word. Point out the two key parts “Trans” (change) and “figure” (shape or form) to define what happened in this story. * Before reading the story tell worshipers that it is about that something that was absolutely amazing to see. Instruct them to close their eyes while you read and try to see with their imaginations what the story describes. In an informal setting, ask after the reading, “what did you see?” In a more formal setting go to the next activity encouraging children (or all worshipers) to draw or write what they saw on paper. http://diglib.library.vanderbilt.edu/act-imagelink.pl?RC=47774 [retrieved January 14, 2016]. * Another way to use great art to unpack this story with children is to show them a transfiguration picture that includes the disciples watching at the side. Tell them that God did this not for Jesus, but for the disciples. Note that the disciples had been living with Jesus every day for several years. They went everywhere with him, even slept near him. Recall some of the things they had seen him say and do. Looking at their faces in the picture, point out that they looked that puzzled and amazed. Insist that they looked that way most of the time. They knew Jesus was special, but they were never quite sure what that meant. By wrapping Jesus in a shiny cloud and incredible clothes, God was telling the disciples, “Jesus is more than a special person. Jesus is God with you.” Conclude with a WOW or some ALLELUIAS. Jesus told stories that made people think about what is important. That was the very worst day. Three days later he was alive again and is still alive today. 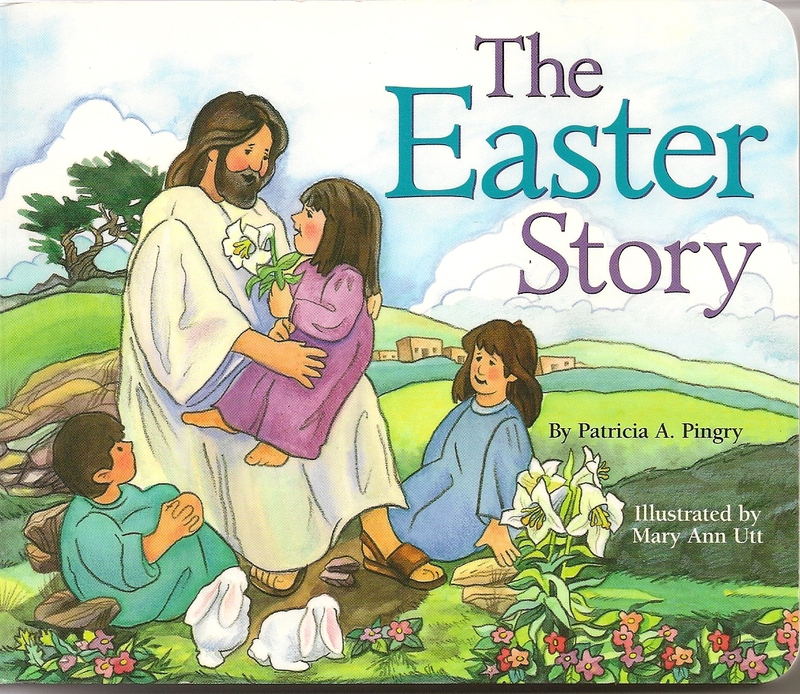 The Easter Story, by Patricia Pingry, is a good readily available short book telling this story. My copy is a board book. If I read it, I would omit her theological interpretations of the story on the first and last pages and simply read the pages that tell the story. Ø If you have a teaching picture file in the church school area, select pictures that tell the major events in Jesus’ life. Display them in order as you tell the story in your own words. If you do not have good pictures go to Vanderbilt Art in the Christian Tradtion to select paintings that can be used from that grand collection at no cost. 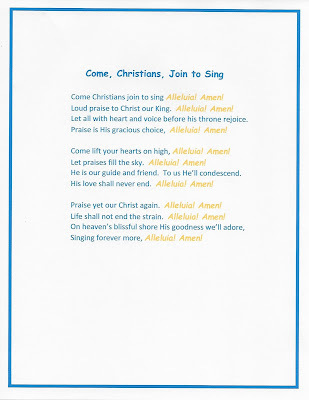 Ø Before the congregation sings the story with “O Sing a Song of Bethlehem,” point out the locations at the beginning of each verse and challenge worshipers to think their way through Jesus’ life as they sing. * If you celebrate Communion today and use the phrase “with the angels and archangels and all the heavenly host” in the liturgy, point out the phrase. Note that Moses and Elijah came to Jesus. In Communion we imagine ourselves joining Moses and Elijah and all the others at a great banquet table. Both are rather shiny events and remind us that we can be connected to God, Jesus, and a whole universe of folks who love them. Recall the mild mannered Clark Kent who changed into Superman. No one ever saw him make the change or knew that Clark Kent was Superman. In this story three disciples actually see Jesus changed into who he really is. Jesus of Nazareth is God’s son. He knows important long dead people like Elijah and Moses. And, he shines! In the Harry potter books transfiguration is a required class at Hogwarts. There it is a matter of changing one thing into another using your wand, charms, and spells. Go to Harry Potter Wiki for detailed information about the course including a video clip of a raven being turned into a goblet before the amazed young Harry and Ron. Unlike the bird, Jesus was not changed into something else (say a goblet). Jesus became more who he really was. He shone with the glory of God. In the first Shrek movie Princess Fiona is transfigured. In a whirl of light and special effects the beautiful princess becomes a large, loving ogre. Similarly, in a flash of light, Jesus who has been revealed to be the son of God “sets his face toward Jerusalem” claiming his task of suffering love. * Read this story and the gospel story back to back, maybe with different readers. Before reading them, point out that these stories are very similar. In one Moses who lived way back at the beginning of the Old Testament spent time with God and came away with a face that shone. In the second Jesus who lived hundreds of years later became shiny all over while he talked with God. - why do they think they were shiny. There are no right or wrong answers to these questions. They are simply ways to imagine together something that was very mysterious. * Children may wonder why Moses and Jesus got all shiny when they talked to God and we do not. Most are satisfied with the answer that we are not Moses or Jesus and that even they did not get shiny every time they talked with God. These were special events. To take it further, refer to the comment from Will Willimon at the beginning of the section on the gospel story for today. This psalm is a series of short phrases praising God who is the glorious king of the universe. Unfortunately, it is filled with the names of people and references to Biblical stories that will not make immediate sense to children (or many adults). Use selected phrases that are clear in the call to worship and responses throughout worship. See one script at the beginning of this post. * There is no way children will get any of this text as it is read. In fact, a group of seminary professors suggested not reading it all and concentrating instead on the two stories for the day. If you do focus on this text in worship…. * To explore Paul’s message that we can refuse to see what is right in front of us, begin with a couple of examples. You can see the dog sitting by the door looking at you with anxious eyes and just see the dog or you can see that the dog needs to go for a walk. Or, you can see a child eating alone in the lunchroom without seeing that the child needs someone to be a friend and eat with her. Then go to the transfiguration story noting that disciples had been living with Jesus for a long time. They knew he was special. He said wonderful things, he told important stories, he healed people, and even walked on water once. 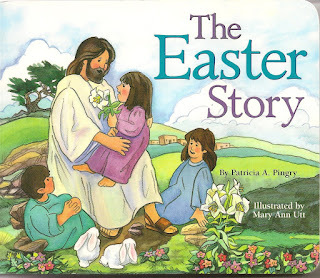 But, in this story, God is telling them Jesus is more than just a special person. Jesus is part of God. He shines like no person ever has or will. Finally, go to Paul’s insistence that though we do not live with Jesus like the disciples did, we still have all the stories about him. We know who Jesus is and what he is teaching us. We can either ignore him and do whatever we want to do. Or, we can recognize who he is and try to be who he wants us to be. Leader: God, when we see a person begging by the side of the road, we try not to see them. People: Open our eyes. Help us see clearly. Leader: Creator of the world, when we see mountains and beaches and trees sometimes we just see stuff we can use. * “Open My Eyes” is filled with images children understand especially after exploring Paul’s message here.